Mission: Impossible Fallout, the sixth movie of the spy franchise which hit theaters last weekend, has been blowing people away with its incredible action. 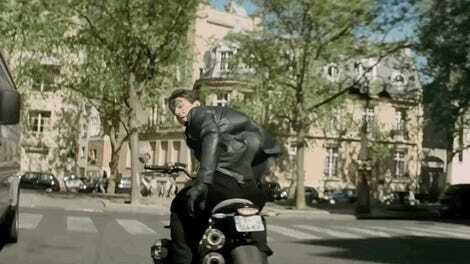 One of the best sequences in the movie is a motorcycle and car chase through the streets of Paris. Here’s how it was pulled off. Wade Eastwood, stunt coordinator for Mission: Impossible Rogue Nation and Mission: Impossible Fallout, among many other impressive titles, is not just the guy responsible for stopping Tom Cruise from killing himself when filming unbelievable stunts. He’s also a Formula 3 and Radical racing driver on the weekends with dreams of racing LMP2 Le Mans. Earlier this week, he took half an hour out of his busy schedule to talk to me about how he managed to execute one of the best chase sequences of the decade, with Tom Cruise on a motorcycle and behind the wheel of an E28 BMW M5 being chased by the police and Rebecca Ferguson’s returning character, Ilsa Foust, through Paris. JW: Do you ever worry that a movie like Mission: Impossible Fallout promoting its dangerous stunts will make your work seem too dangerous and maybe even out of control? WE: No. Never. Nothing will ever happen in the movie unless I give the OK on it, action-wise. I create the actions sequences anyway from the get go, they’re not written into the story before we begin. And then together we create something and I will go and rehearse and shoot stunt-vis of these things with my team and then present it. [Stunt-vis is like pre-vis storyboarding, but for stunt sequences.] And then if we like something and we really want to go for something, I’ll work out how we can logistically and physically accomplish it. So, anything is possible, but obviously when we’re doing it for real, not shooting against green screen, you’ve got to be a lot more savvy with how you break it down. I risk assess everything, it’s my job. I don’t risk assess when I create, it would limit my creation. So I create with an open mind, and then once we agree, “right this is what we’re doing, hanging on the side of an airplane or we’re going to do this stunt like jump out of a plane at 20,000 feet, or fly a helicopter through a canyon,” then I start to break down how I can safely do it. If any of those things don’t happen, or the schedule or something dictates that they can’t happen, then the sequence doesn’t happen. If they really want the sequence, they have to adhere to the schedule that I preset for Tom in order to be ready, or for any of the actors to be ready to do the sequence. And that’s the way it goes, there’s no shortcuts, and there’s no pushing me around when it comes to that. That’s for sure. 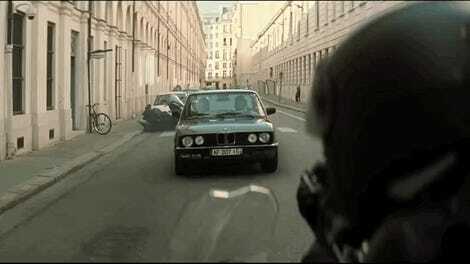 JW: Why was an E28 BMW 5 Series selected for the big Paris car chase, especially when the new M5 is also in the movie? WE: The new M5 is amazing as well, I did the drifting, the radio control sliding in it. That was me sort of hidden in the car. That car is power, the new M5. It’s unbelievable. I’m a massive car guy, I race Formula 3 in Europe and stuff, so I’ve always been a massive petrolhead, and when we were doing the BMW stuff on Rogue Nation I taught Tom how to drift and do all of that stuff, and we just love cars. Tom is a massive petrolhead, too. We go cart racing, we do loads of car stuff together. And we’re just looking at different cars. [Fallout production designer Peter Wenham] is great, I’ve worked with him before and he’s really good, and he also loves cars. We’re looking at all sorts of things, “oh, it’d be great to get something classic,” and we’re all talking. I can’t remember who said it when we were talking about the [E28] M5. I remember growing up in South Africa—well the M5 was only produced in Germany and South Africa back in the day, that series of car, those 1985 to 1987 cars. That was like the super car when it came out, I remember it. And so I was like “I’ve got to show [McQuarrie] this color.” When you put it as a color palette with the cobbled streets of Paris and the textures and tones at that time of year, it’s going to be incredible. So McQ came down and straight away he’s like, “Well it’s a risky color, but I love it!” And then when we showed all these guys this green BMW, it just got better and better and better, and everything complimented each other. Trashing around the M5, my god we hammered those cars drifting and driving and all of the training and stuff we did. The car was bulletproof. It was really cool to be able to do it in that series of car, the E28, and then have the new one showcased as well. It’s a little bit of a homage to the great work that BMW do with the M Series of cars which I love. JW: What modifications were done to the E28 BMWs, if any, and how many were used for filming? WE: We had about, I want to say, five or six. I rolled one rehearsing the jump down the stairs. We modified the suspension for that one for the jump down the stairs just a little bit so we’d have more sag and droop, so that the car doesn’t roll. I had a car designed to roll, I wanted to try and roll it to see the worst case scenario if it happened. So we put all of the modified running suspension in that one just so we could spin it down the stairs. But obviously having two actors in it I wanted to make it not-rollable, you know what I mean, so nobody dies. So I tested that to the max, I mean we tested it to the limit, but the rear axle just broke and folded in on itself. And then we modified that one, modified it, modified it and got it to a place where it could do pretty much anything. And that was it. The rest of the cars we didn’t really modify. We modified the handbrake on them to give us a bit more clout, so you didn’t rip the handbrake out. So it was a nice tight handbrake. We changed the rubber on them, and they were pretty stock. JW: What is driving training like for Tom? He’s done similar sequences and training in the past. What exactly do you have to tell him to do? WE: So, Rogue Nation was really solid in accelerating his driving skills, and then for Fallout we just picked up where we left off. We’d done so much driving on [the previous movie]. So Tom can already drive really well, he’s a really good driver. Drifting, as I’m sure you’re aware, is a whole different thing. And I love teaching it, because I’m a drifter but I also race in Formula 3 and Radicals and stuff. Showing Tom the racing line—which you’d never need on a movie anyway because you’re never driving as fast as you can around the street, because you need to keep up with the camera and want to make the car look amazing rather than just disappearing into the yonder—he already has the understanding of the car at speed and under braking, and upsetting the balance of the car. On Rogue Nation we would go out and I’d rent one track every week and we’d train at some of the best tracks in Britain, you know Goodwood Race Circuit, Silverstone, Brands Hatch and Bedford and all these amazing places, and I would go out and teach Tom the art of drifting. Upsetting the balance of the car, shifting the weight, all of those things, and get him to a level where he was very comfortable. And by the end of it—it has to be consistent for me. In order to go on set with a film crew, with camera positions around, film crew around, and all those sorts of things you can’t just do it once, and be like, “Oh yeah I did it! Great.” And then take two you’re 20 feet off your mark and wipe out a camera or something, or hurt yourself. You have to be consistent. With me, I drill it. I’m notorious for my long rehearsals and drilling. I don’t care if you can do ten in a row, you better be able to do 100 in a row. So I would set up a course with boxes and cones and different things, almost like a shooting range, and if he was ever off his mark, we weren’t ready. We were ready when Tom was ready. All that stuff on Rogue Nation, he was so consistent. He was within a foot of his mark every single time, drifting at high speed around corners and scrubbing speed from like 100 mph down to 40-50 mph for a small drift and making the car look energetic and active on camera. It’s an art to do that. If you get a racing driver and he just drives it, say, OK, you’ve got to brake at this point and turn in, he’ll brake and turn in and it looks pretty boring, because a racing driver is meant to make the car as stable as possible and turn as efficiently as possible and accelerate out as efficiently as possible. Whereas when you’re drifting or doing film driving, you’ve got to make the car look unsettled and uneasy but still be in control. And that was what the drilling we did for Tom to teach him. And he was unbelievable at that, and on the bike. The car stuff, he really impressed me with the car stuff. He was so consistent and so in control on the drifts and slides, so when we got the E28 M5 on this we went on some tight courses like Bedford, and we just picked up where we left off. It’s a different type of car, different balance, I set the balance slightly with adjusted suspension, and that was it. And he went out and ripped it around and picked it up straight away. Obviously it’s not a new M3 [like in Rogue Nation], it’s an older car, a bit more movement, but he adjusted his driving style and got it in no time. And the sequences in Paris were brilliant. It looked like he was on the limit but he wasn’t, he always had some in reserve. JW: What is the production’s relationship with BMW like, providing the cars and motorcycles for the action scenes? How involved is the automaker? WE: They are involved in some way, product placement, but I don’t know the ins-and-outs of the deal. JW: You just get all the toys to play with? WE: Exactly. I need five of those and I need six of those and seven of those of something, and they give it. Ten motorbikes with tire warmers, and I get it. But with the retro M5s, we had to go out and source those and find them. BMW didn’t have them. “No it’s not, we’ll take care of it.” And then obviously watch the movie, and I’m sure those guys are crying right now. It’s not a waste. Look how cool the car is in the movie! We just relaunched the E28 M5! Should have bought them all, dammit. JW: How did you manage to pull off the motorcycle chase around the Arc de Triomphe? WE: I had 70 drivers and I had the Arc de Triomphe for one hour. I had mainly racing drivers, who I race with, and stunt drivers, because I needed them to hold a gap and hold speed, but also change a gap and change lanes while also being very aware of where Tom is on the motorbike at the same time without upsetting the moving circle. I had three circles going, and I knew I had it for an hour, so the cars are full of fuel, I put the boys and girls out as soon we got the road locked, and I had them start the circle and do their lane changes. I told them all that morning don’t drink any water, you’re not going to stop for an hour. They drove those circles for one hour solid. Whether we shot, whether Tom was on the motorbike or not, those cars just kept going around, changing lanes, and going around doing their thing. “Three... two... one... action!” Tom would feed into the circle, and they would make adjustments. And we kept going like that for the one hour, it was the most amazing sequence to be a part of. The way I set it up, I didn’t want to have to make adjustments and have any form of confusion amongst the drivers, so they had a definite plan of their radius and what they were doing, and when they were changing lanes and what they were doing, and then they would react to Tom, and Tom would react to them. And everything was very subtle and nothing quick, so that everyone had time to react. JW: How long have you been racing, and how did you get into it? WE: It’s been my passion since I was a kid, since I could remember driving on my dad’s lap steering at four years old, and it’s always been my dream. It’s just a very expensive sport and I didn’t have any family or anyone that could help me. I didn’t have the money when I was young, and it was very frustrating. I only started testing cars and really racing about five years ago. I was the oldest guy by thirty years at the track. When you’ve got 17-year old kids going through Formula 3 and on their way up to Formula 1, and here rocks up this 40-odd-year old guy, I keep my helmet on because I look like everyone’s dad. I literally would! And I had no idea about this stuff, but I made a little bit of money from film work, I’ve been doing it a long time, and I paid for a test and it would have put me nearly on pole in the race, so they were quite impressed, they cut me a little bit of a deal, and I went out. Two years ago I raced a Class-D car and won, and then last year I raced a Class-A Formula 3 car in Europe. In five races I got five wins, and then I got two second-place finishes, and then I had engine mechanical problems, and I could have won the season if I had been able to do it. But obviously with shooting Mission I missed most of the season. So I needed eight races, and I got five firsts, two seconds, and a crash. It’s something I’d love to do. It’s my passion, it’s my dream. I think it’s far away from me now because of my age, and it’s so much money in the sport. It’s so much money, it’s all about money. I’m like, what? It’s crazy money. It’s the same as Formula One and everything. I’ve got 10 or 12 racing driver friends of mine, all these guys would absolutely destroy a lot of the guys that are out there racing at the moment in GTs and all sorts of things, but they’ll never get the opportunity because of the money. JW: How do you manage to balance your movie career and driving? WE: It’s super difficult. I race any chance I can. I’d like to definitely race LMP2 Le Mans soon, so I’m testing with Ginetta factory team in two weeks and I might do one F3 race this season if I can, and two Radical races. I’m like, “well I’ve got to leave early because I’ve got to fly out and race in Barcelona this weekend in Formula 3,” or a Radical championship at Silverstone, or a six hour race or a 12 hour race, and they just laugh at me. They’re like, “You’re going to die. you need to take a break.” I just don’t like taking breaks. I don’t like stopping. JW: Is there anything you’d like to add? WE: I’m currently working on Men In Black right now with Chris Hemsworth and Tessa Thompson. I just taught [Hemsworth] to drift the other day in an old car, you’ll have to wait for the movie to come out. But he’s never done any driving or drifting at all. He’s very much just a surfer dude and a really cool guy. And he nailed it, like he’s on it. He’s very precise. I try and get him having fun, and getting more people into cars. Everyone should be a petrolhead in my eyes. Update: A note regarding the model of E28 used in production has been added for clarity.